Do I Need Flashing Over My Windows? You are here: Home » » For the Homeowner » Home Maintenance-Consumer Info » Do I Need Flashing Over My Windows? A popular retrofit for older homes is new windows, but you may not be installing them correctly. Proper flashing is one concern. As I sit next to my aluminum framed, single paned windows that are almost fifty years old, I feel the cold, causing me to wonder why I have not replaced them yet. A few weeks ago, I discussed window replacement with a neighbor, who has been working to upgrade their home. Last year another neighbor had changed out ll of his windows. There are many steps to energy efficiency, and window replacement is one item that tops the list for many homeowners. Replacing windows is not that hard, so the task can be a great do it yourself project; however, you have to consider the possibility of adding flashing over the window. If you have walls with some type of cladding like wood, you have windows that come out beyond the cladding surface with trim. Windows in homes with a brick exterior are typically recessed. This is the case for stucco exteriors as well on most occasions. On walls with sheathing or planks, you will see the window covered by trim, or the window frame will be slightly beyond the surface of the exterior wall covering. This does not make the job of replacing the windows harder, but there is a step that can be forgotten. The photographs above were taken during a home inspection of an historic house that had new energy efficient windows installed. Notice anything different? Above one of the windows you see a piece of metal sticking out between the top of the window frame and the trim; this is the flashing. Some people refer to the required flashing as “z-flashing”, because it has a shape like a “z”. You also have j-flashing or L-flashing. Another term is kick-out flashing. This last term is used more for the flashing on the fascia under the roof. I have the tendency to use only the word flashing in my inspection reports, because it is simpler to understand than explaining the different methods that can be used for installing this device. Why do I need this flashing? Rain does not come straight down. During a windstorm, rain is blown onto your exterior wall, even under the roof’s overhang (soffit and fascia). The water comes down the wall to the trim around the window. (With recessed windows, the water drops to the sill, which should be angled to move away from the home). Here is where installation methods could vary. If the trim is flush with the exterior wall, you will want the flashing to sit on top of the trim, and then come over the front face of the trim. 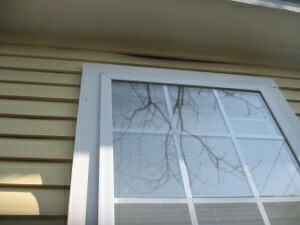 Water that sits on the trim can damage the wood of the trim piece. In the case of the home in the photographs, the upper trim is some distance away from the wall, so the flashing catches the water running down the wall at the top of the window, forcing it to flow away from the wall. In both cases, it is best to have part of this flashing on the wall behind the exterior cladding. Any water that comes behind the cladding will be caught by the flashing above the window, directing it away from that flat surface of the top of the window frame. Is this flashing always necessary? There is a new window design that I have been told by builders that it does not need this flashing. The top frame of the window has two channels around the edge. The window is sealed with caulking around the edges. Water coming down hits the top of the window frame, going into one of these channels, and then down the side of the window. I am a little concerned about this method as the house ages. If gaps arise, which allow water behind the exterior cladding, the water will run down the sheathing. This is fine, because all builders create homes to handle this situation (on brick homes, the weepholes at the bottom of the wall help expel this moisture). Will this window style help navigate water from standing at the top of the frame? Supposedly it does, but for me seeing is believing. Too often a manufacture can make a claim that they in good faith believes to be true, but could be hampered by how the unit was installed. On my home inspections, I have noticed that this type of window unit does not have trim surrounding it. Although the photographs are of a home built in the 1920s, I find that some builders even today forget about this flashing. Moisture damage can happen. Even after a year, I have seen caulking begin to fail. 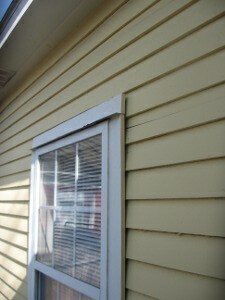 The other area to check when replacing windows is the wood sill. Not all windows have sills, so it may be the bottom trim piece. Something to check before you begin installing the window, or you will be heading back to the home center for more supplies. This entry was posted on Monday, January 10th, 2011 at 2:24 pm	and is filed under Home Maintenance-Consumer Info. You can follow any responses to this entry through the RSS 2.0 feed.